Tag line: "Come to Laugh, Come to Cry, Come to Care, Come to Terms"
The year 1983 was a turning point in my progression as a cinephile. Thanks in large part to a new video rental store that opened up in my area, I was suddenly able to check out the Oscar-nominated movies well before the Academy Awards were broadcast. Alas, that year also marked the first time the Academy really disappointed me. Convinced Philip Kaufman's The Right Stuff was one of the finest films I had ever seen, I was dumbfounded when the Oscar for Best Picture went to Terms of Endearment, a movie which left no lasting impression on my young teenage brain. Yet as my brain (and I) matured, I found myself appreciating Terms of Endearment a bit more with each successive viewing. 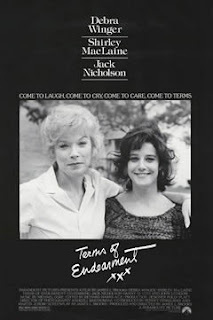 Avoiding most of the trappings of a sappy melodrama, and due to the combined efforts of writer/director James L. Brooks and his talented cast, Terms of Endearment is a family drama that rises above the limitations of its own material. Its story spans several decades, following the sometimes tumultuous relationship that exists between a mother and her daughter. Aurora Greenway (Shirley MacLaine) is a strong-willed woman whose sharp tongue and blunt observations are often more than her free-spirited daughter, Emma (Debra Winger), can stand. Emma even goes so far as to marry Flap Horton (Jeff Daniels), a man her mother is convinced will amount to nothing. As the years pass, Emma and Flap do face some problems, though much to Aurora's chagrin, the couple is able to work out most of their differences for the sake of their three children. As for Aurora, who has, for decades, spurned the advances of many suitors, she finds herself smitten with next-door neighbor Garrett Breedlove (Jack Nicholson), a former astronaut and current womanizer. But while life has taken them in separate directions, Aurora and Emma are never far from each other’s thoughts, and in time, the bond between the two becomes stronger than ever before. On paper, Terms of Endearment has all the makings of a Hallmark Channel Movie-Of-The-Week (just look at the above synopsis if you don't believe me), with conflict, tragedy, and, ultimately, love to carry its characters through. Yet the film is so much more than your standard mother-daughter fare. MacLaine’s Aurora cares little for the feelings of others, and is prone to selfish behavior. When Emma and Flap announce at a dinner party that Emma is pregnant, Aurora reacts angrily, none too pleased she's suddenly old enough to be a grandmother. Still, MacLaine never permits Aurora to drift into single-note territory, allowing genuine emotions to occasionally poke holes in her icy demeanor (perfectly conveyed in several scenes where she and Emma are talking on the phone). On the flip-side is Winger's Emma, who initially can't seem to grow beyond a certain point, rebelling against her mother while seeking her approval every step of the way. But what could have been another “Weak-Daughter-Who-Married-The-Wrong-Man” character transforms into a well-rounded individual right before our eyes, a person dealt some devastating blows by life who, because of them, discovers she is her own woman. Smartly written and expertly portrayed, Aurora and Emma easily transcend all stereotypes. I still wouldn't rank Terms of Endearment over The Right Stuff, but at least I now understand what the Academy voters saw in this film all those years ago. Love this movie. I try not to cry but that final scene of Emma's passing is just too much. It's one of my guilty pleasures, movie-wise. Yes, it's a chick flick and a tearjerker (my tears included, though surreptitiously hidden from those watching with me). But the acting is top of the line. And Jack Nicholson - what can I say? Good review!